If you anytime traveled to unknown areas you know the importance of maps. They help you to travel easily making your journey pleasurable. The same holds true for web sites. The visitors coming to your web sites should be presented with simple yet flexible navigation structure so that they can travel to various parts of your web site easily. 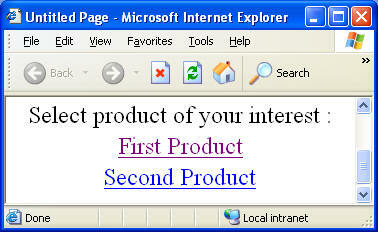 ASP.NET provides a feature called SiteMap that help you achieve this goal. In this article we will explore what site maps are and how to develop web site navigation structures making use of them. A site map is an XML file that details the overall navigational layout of your web site. You can then consume this site map file as per your requirement. The site map file must have extension .sitemap. Here, we have directory structure of a sample web site. The home page (Default.aspx) and Contact Us page (contact.aspx) are residing in the root folder of the web site. There are two sub folders called Products and Services. Each have two web forms - Product1.aspx, Product2.aspx and Service1.aspx and Service2.aspx - respectively. Now let's represent this web site structure using a site map. 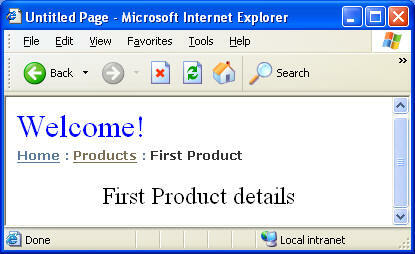 Create a new web site using Visual Studio. Right click on the web site and choose "Add New Item...". Select Site Map from the "Add New Item..." dialog (see Figure 2) and give name as Web.sitemap. Now key in the following XML markup in the web.sitemap file. The root of site map file is siteMap. It further contains a node called siteMapNode. Inside it contains several siteMapNodes depending on your web site structure. title Indicates the title of the page. 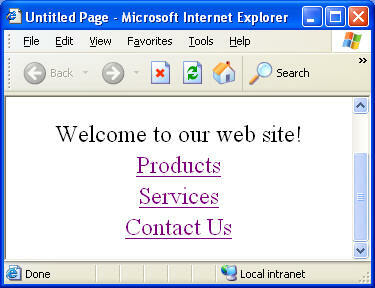 This attribute is often used by navigation controls to display title for the URL. This makes your site map. You can now think of using it for navigation purpose. The SiteMapPath controls displays various levels of navigation. You can click on parent or root levels to navigate back or at the top level. You can of course customize the navigation levels. 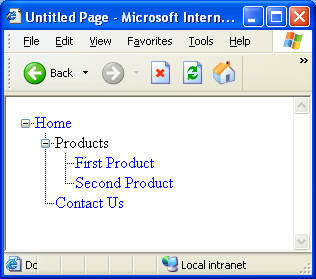 ASP.NET 2.0 comes with nice set of navigation controls that include TreeView and menu. You can bind the site map file with these controls with the help of SiteMap Data Source control. At times the inbuilt navigation controls may not meet your requirement. In such cases you can access the site map file programmatically and read various siteMapNodes. 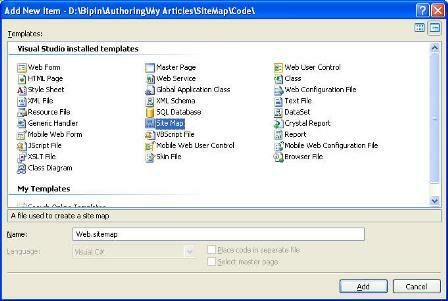 You can then render a custom navigation structure using title and url attributes of siteMapNode. Before we delve into mode details let's first create the required directory structure and web forms. 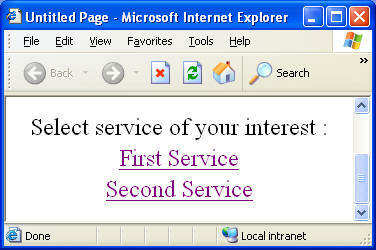 Begin by adding two folders to the web site called Products and Services. Then add a new Master Page to the web site called MasterPage.master. Add the web forms as shown in Table 2. Make sure to set master page for all of them while adding. Now, open the Master Page that we added previously. Drag and drop a Label control and a SiteMapPath control on it (SiteMapPath control can be found in the Navigation node of the VS.NET Toolbox). 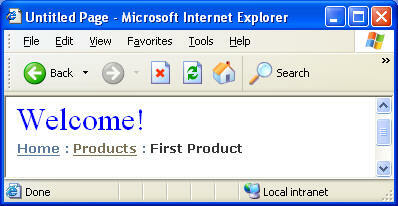 Set the Text property of the Label to "Welcome!". The following listing shows the complete markup of MasterPage.master. Now open Default.aspx from the root folder. The Default.aspx should look like Figure 4. Now open Default.aspx from Products folder and design it as shown in Figure 5. The following table lists the HyperLinks used in the web form. Now, run the Default.aspx from the root folder and navigate to Product1.aspx page. Figure 7 shows the sample run of the web form. Note how title and url attributes from the web.sitemap file is used to render the "breadcrumbs". Also, note how the parent levels are displayed along with the current page title. Try navigating to various pages and observe the SiteMapPath control. The use of site maps is not limited just to SiteMapPath control. You can also attach the site map to navigational controls such as TreeView. In this example we will use the same site map file to bind with a TreeView. Add a new web form called SiteMapDataSourceDemo.aspx to the web site. Drag and drop a SiteMap Data Source control (SiteMapDataSource1) and a TreeView (TreeView1). Set the DataSourceID property of the TreeView to SiteMapDataSource1. Also, set ShowLines property of TreeView control to true. Below is the complete markup of SiteMapDataSourceDemo.aspx. Now run the web form and see how the same navigation structure is automatically rendered in the TreeView (Figure 8). Displaying site map data in SiteMapPath or TreeView control works great. However, at times you may need to device a custom rendering logic. For example, you may want to develop a custom navigation control that displays only the parent levels; that too in vertical direction. In such cases you need to access the site map file programmatically. The SiteMap class allows you to do exactly that. The SiteMap path has two important properties - RootNode and CurrentNode. Both of these properties are of type SiteMapNode and give you the reference of root node and current node of the site map respectively. The Table 7 lists some of the important properties of SiteMapNode class. In the following example we will use SiteMap path to access the individual nodes of site map file. We then programmatically add them to a TreeView control. Add a new web form called SiteMapCustom.aspx. Drag and drop a TreeView control on it. Add the following code to the Page_Load event of the web form. Here, we first get the total number of child nodes of the root node. Then we loop through the ChildNodes collection of the root node. With each iteration we create a new instance of TreeNode class and specify its title and url in its constructor. We then add this TreeNode to the Nodes collection of the TreeView. We check if the current SiteMapNode has any child nodes. If it does have child nodes we iterate through them repeating the TreeNode creation process. Note that this time we add the new TreeNodes to the ChildNodes collection of the current TeeNode object. Note that since we know that there are only two levels of nesting we used two for loops. To make your logic more generic you may use recursion to populate the TreeView. Run the web form and you should again see something as shown in Figure 8. Web site often implement role based security schemes. For example, you may have different roles in your application such as Administrators, ProductTesters and ServiceTesters. In such cases you frequently need to control the site navigation links shown to the users. For example you may want that if the currently logged in user belongs to ProductTesters role then on the links related to products should be displayed otherwise they should be hidden from him. One way to deal this way is via manual coding but it will involve programmatically taking care of all the authorization logic. Fortunately, the site map file and SiteMap Data Source control together provide a feature called security trimming that helps you achieve just that. 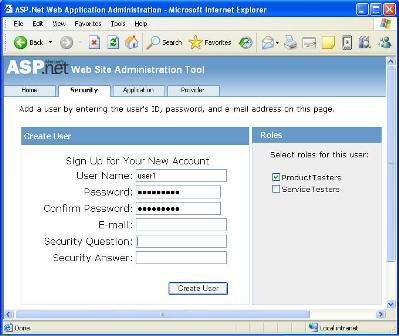 Create two users using the Web Site Administration Tool called user1 and user2. 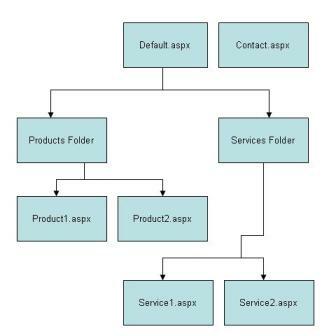 Add user1 to ProductTesters role and user2 to ServiceTesters role (Figure 10). 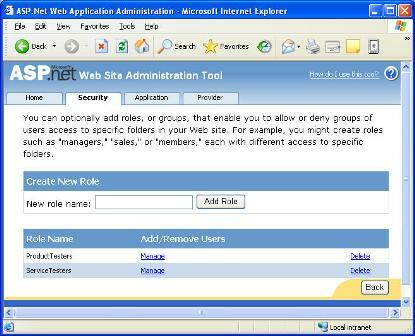 NOTE: By default user and role information is stored in ASPNETDB database from App_Data folder of your web site. This database is automatically created by ASP.NET if it doesn't exists. Most of the markup is the same as we wrote in web.sitemap file earlier. However, there is one important attribute - roles - added to Products and Services siteMapNodes. The roles attribute specifies the role for which this node and its child nodes are accessible. Since Products related links are to be displayed only to the users belonging to ProductTesters we set roles attribute of Products siteMapNode to ProductTesters. On the same lines we set roles attribute of Services siteMapNode to Servicetesters. The siteMapNodes that do not have roles attribute specified are accessible to all the users. Also, note that Products and Services nodes no longer have url attribute specified. Here, we add <siteMap> section and specify a provider pointing to SecurityTrimming.sitemap file. Note that securityTrimmingEnabled attribute is set to true to enable security trimming. Once we configure the <siteMap> section the SiteMap Data Source control will automatically pickup setting from this section. Add a new web form to the web site called Login.aspx. Drag and drop a Login control on it and set its DestinationPageUrl property to "~/SiteMapDataSourceDemo.aspx". We developed SiteMapDataSourceDemo.aspx previously (refer section titled "Using SiteMap Data Source control"). 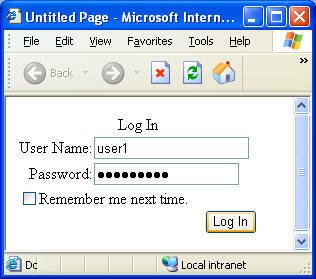 Run the Login.aspx (Figure 11) and enter credentials for user1. Once you login successfully you should see the TreeView as shown in Figure 12. Since user1 belongs to ProductTesters role the service related links are hidden. 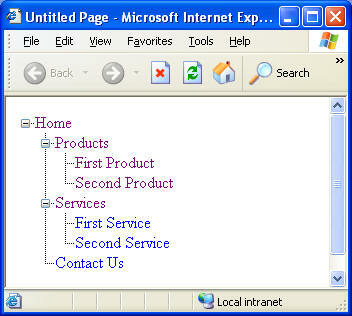 Site map is an XML file that details the structure of your web site. You can consume site map file to generate navigation structures. There are three common ways to consume site map files viz., using SiteMapPath control, using SiteMap Data Source control and using SiteMap class. You can also enable role based security to the navigation links rendered using a feature called security trimming. These controls and classes together help you create a professional navigation structure for your web sites.